Winter’s Here. Our first Christmas with the Bus. It’s December 2009. We’ve mothballed the bus. Driving around in Winter. Regardless of how many layers you wear to battle the cold, you can’t get rid of the condensation on the inside of the windscreen unless you have a heater that works. And you have to roll down the door windows so you can see out sideways. Visibility is not the only problem. At this time of year driving the bus gives a new perspective on wind chill. So we SORN’d the mustard custard, bought it some Jim Jams and put it to bed for the winter. This didn’t mean bus things stopped. Oh no. This is when the real refurb plans began to take shape. We had big plans. And I mean BIG PLANS. We’ve all seen Grand Designs where the home owner takes on all responsibilities. Same thing applies here. Simply roll up the Project Director, Project Manager, Chief Designer, Head of Procurement, Site Manager and Quality Control into one person. Not me obviously and let’s make this loud and clear. I’m not the person to take on all that responsibility. Sarah was definitely the inspiration for most of the refurb. We had decided we were going to take the bus on the road in the summer of 2010. A proper Road Trip. Into Europe. Into the wide open and beyond. 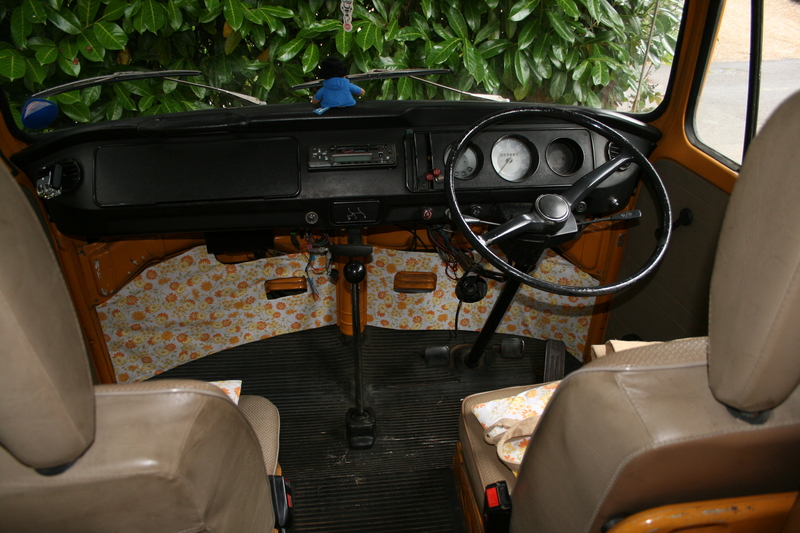 But before we did that….. we we’re going to make sure the bus would be fit for our purposes and needs. A few things would be ripped out and new things put in. This was going to require co-ordination. Colour and style co-ordination. In the dark dank grey of mid-winter we were heading headlong into a colour and style coordination storm. I had a feeling this wasn’t going to be pretty. Ironically, that’s exactly what Sarah wanted it to be. It was time to swap seats. Sarah was the driver and me the passenger. Although, technically, I still had the petrol filler up job, which is a driver’s job really, isn’t it. Sarah had some great ideas. And I mean great ideas. She was going to choose the colours, the patterns and the style. I was there to nod, agree, nod some more, listen, make notes and then put it all together in the right order, which is not necessarily the order in which my instructions come. New Bed Cushions – the old ones were made of foam that was trying to transpose itself back into the oily stuff it was originally made of. It also harboured a stickyness and smell that really didn’t make you want to sit on it never mind sleep on it. It was made out of a material that was great for “Skibbereens”. New Pop Top – taht’s the roof that pops up. The old one was made out of the material from a returning Gallipoli veteran’s pants. Not nice. New curtains – the old ones were not that bad other than in colour. They had to go. Rebuild the interior cupboards. The layout had a poorly built kitchen cupboard for the cooker that sat behind the passenger seat. The original sideboard including wardrobe, sink and storage cupboards along the length of the bus behind the drivers side was rotting in places. Good functional space, but the rot just added to the general dank smell. Replace the flooring. The existing one was beginning to fall to pieces. Reline the headlining on roof. This is a specialist’s job. Not one for us. Paint job. Not sure if we have the heart to give it a re-spray. We’re not trying to pimp it up. Just one question. How many mothballs you can fit in a bus? Millions I reckon. There would be no moths kipping in our bus over winter. For some reason we were planning a return trip. That’s a trip that gets you there and then back again. True Faith I think they call it. Listen? A bloke? Eh? Whoever heard of that? If you’re a girl listen up. Generally us blokes will try to do everything you want us to do. But being blokes we will start with the first thing you ask us to do and then when that’s done we’ll move onto the next thing and so on. So when you ask us to do things please make sure you tell us in the order you want to see them done in. None of this “I want you to hang the bed linen out to dry, pick up some bread from the bakers, strip the bed, put the bed linen in the wash, get some meat from the butchers, and make me a cup of tea I’m thirsty” kind of carry on. That cup of tea will be a long time brewing. Don’t make us guess. Skibbereen: The sucking noise made by a sunburned thigh leaving a plastic chair. Ouch. 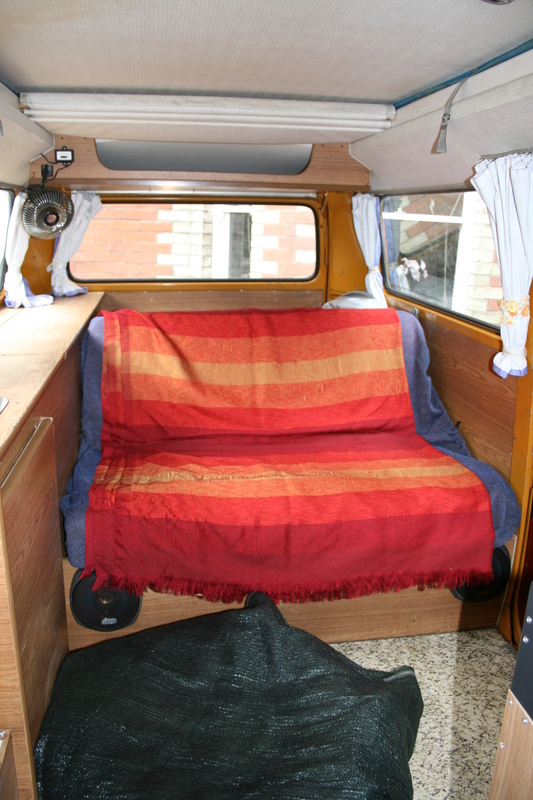 This entry was posted in The SapaBus Blog and tagged campervan refit, VW Bay, VW Campervan.